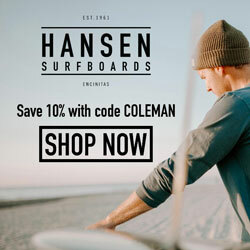 Are you looking for unique scuba locations that will bring you close to sea creatures and enhance your underwater experience? 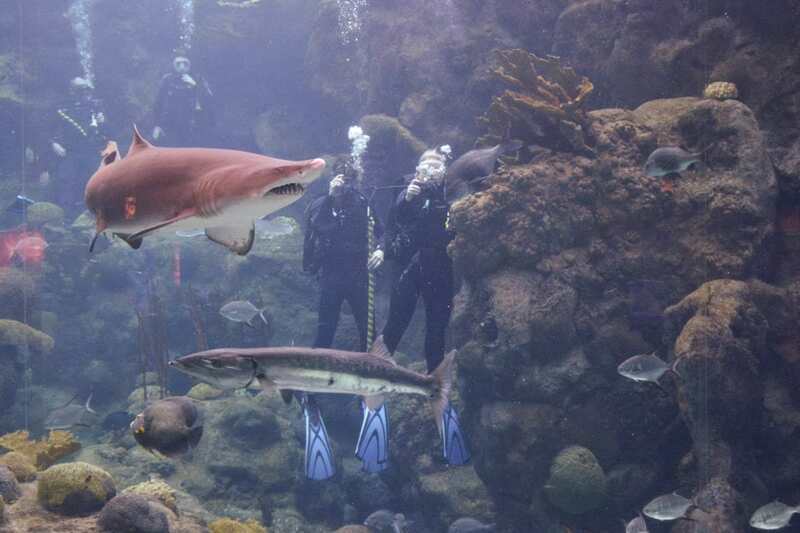 How about diving with sharks at The Florida Aquarium in Tampa Florida? Like so many people, my first experience with coral reefs came through watching colorful tropical fish swimming in an aquarium. I imagined what it would be like swimming alongside them as I stared wistfully into the tank. Now replace those cute little tropical fish with a 20′ long tiger shark and see what that does to your dream! 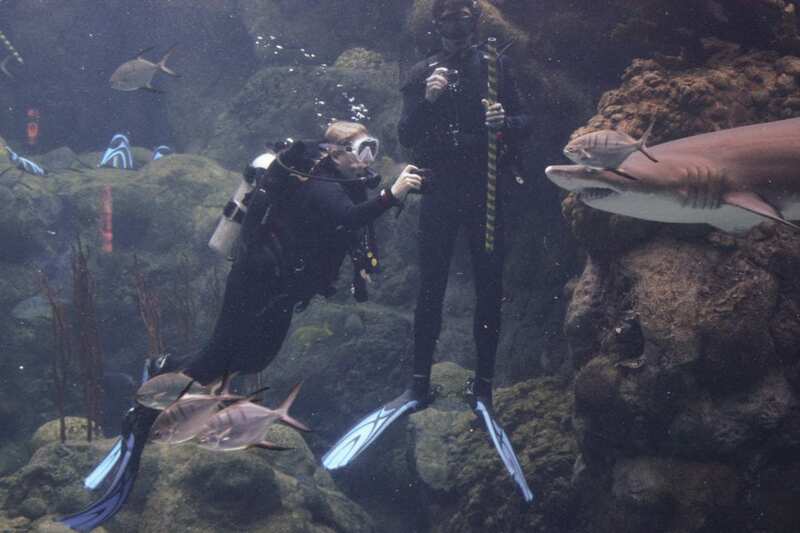 The Dive with the Sharks Experience at the Florida Aquarium fulfilled that childhood dream and ignited my imagination for future underwater exploration. Scuba divers use the idiom – it’s like swimming in an aquarium to describe dive sites teeming with life. 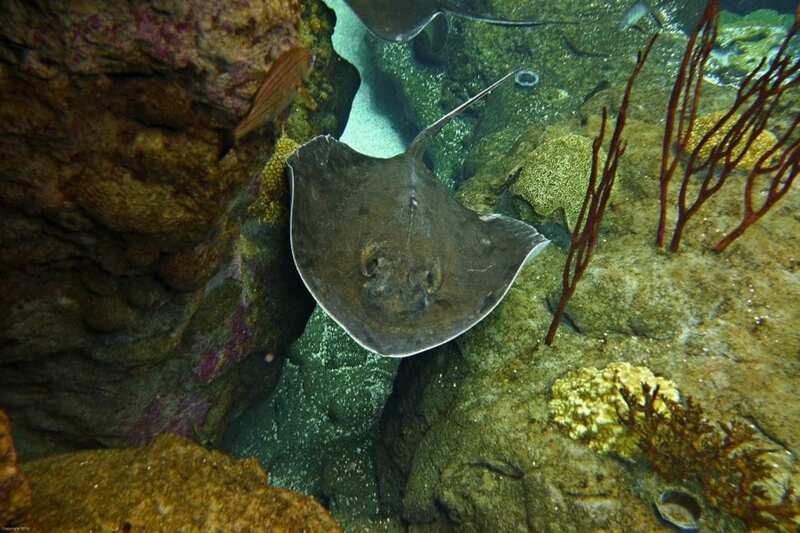 I used it myself on my recent dive trip to Cozumel and the incredibly diverse Blue Heron Bridge dive in Riviera Beach. Of course, these dives didn’t compare to actually diving in an aquarium, and I certainly wasn’t face to face with sharks! 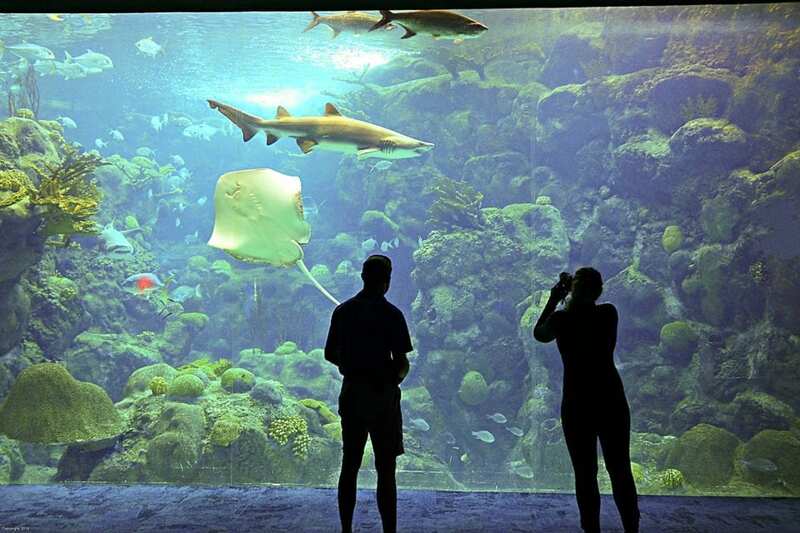 The Florida Aquarium in Tampa offers divers a rare chance to plunge into the aquarium’s largest tank filled with sharks, moray eels, barracuda, a green sea turtle and more. Not only are these specimens plentiful (1000+ fish in the tank!) and beautiful, but they have been around divers enough to shed their natural fears and let their personalities shine through. I might hold back on that catchphrase now that I have really experienced diving in an aquarium. Tampa is an easy day trip from my home in Orlando, so I drove out following an early breakfast. I met up with Katie (@travellingspud, The Traveling Spud) who helped set the trip up. We arrived shortly before they opened at 9:30, and we were shown to our changing room. We felt like royalty with our names on our locker and all the gear sized out and waiting for us. They would have let me use my own mask, but it was a casualty of the early morning start and spent the trip hanging out on my kitchen table. No worries, they had everything provided for us. 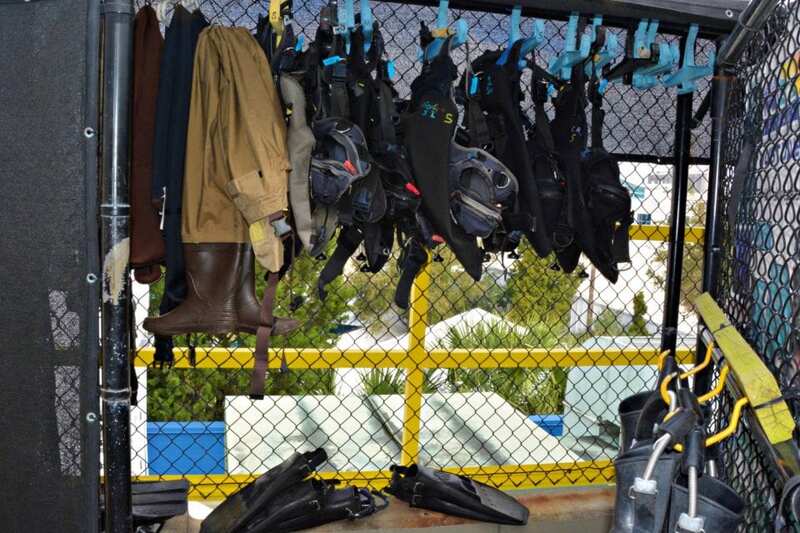 After suiting up, we headed down to the base of the coral reef tank for our dive briefing. 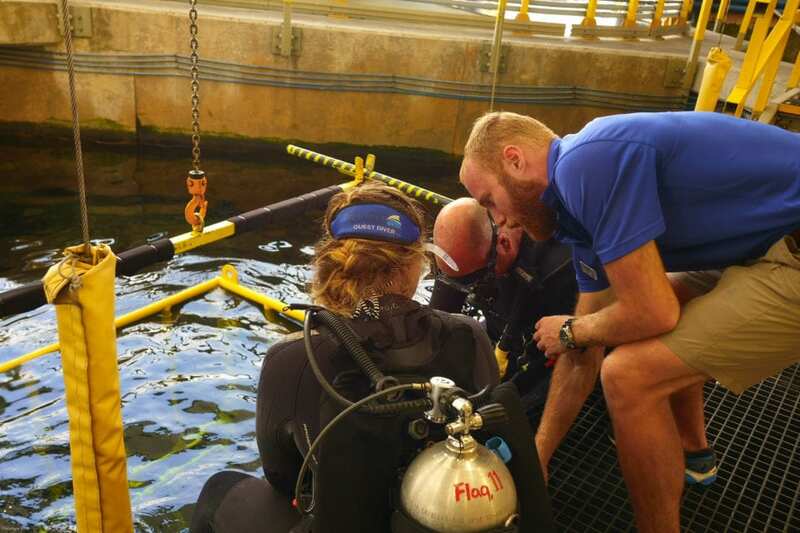 Much like shark diving in Playa Del Carmen, this dive briefing didn’t feel the need to stress safety issues with the sand tiger sharks or nurse sharks that were waiting for us in the tank. 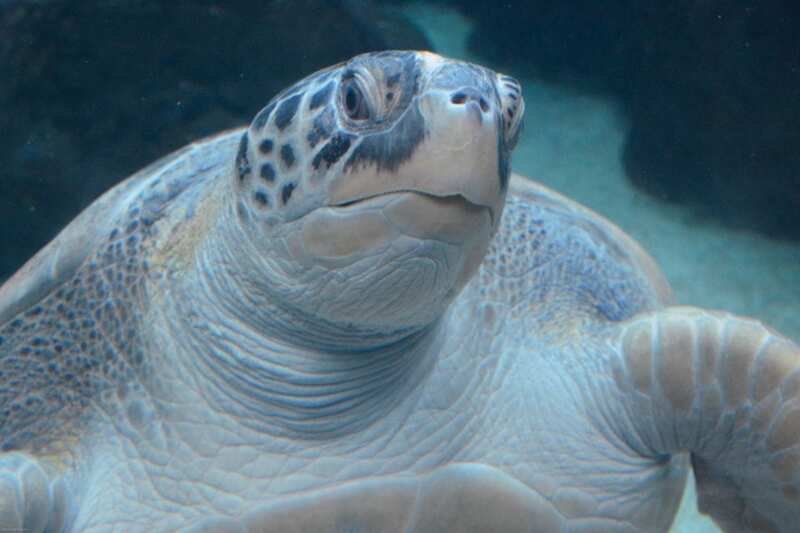 The animal we needed to be on the lookout for was Flip, the rescued resident green sea turtle who ruled the tank. Our dive masters warned us that he always gets what he wants, and we should just let him pass by us if he comes near. With that, we went back upstairs to enter the tank. The royal treatment continued as we were getting our dive gear on. Katie and I each had a personal dive master who helped us into our BCD and secured our fins. I felt like Cinderella getting ready for the ball. 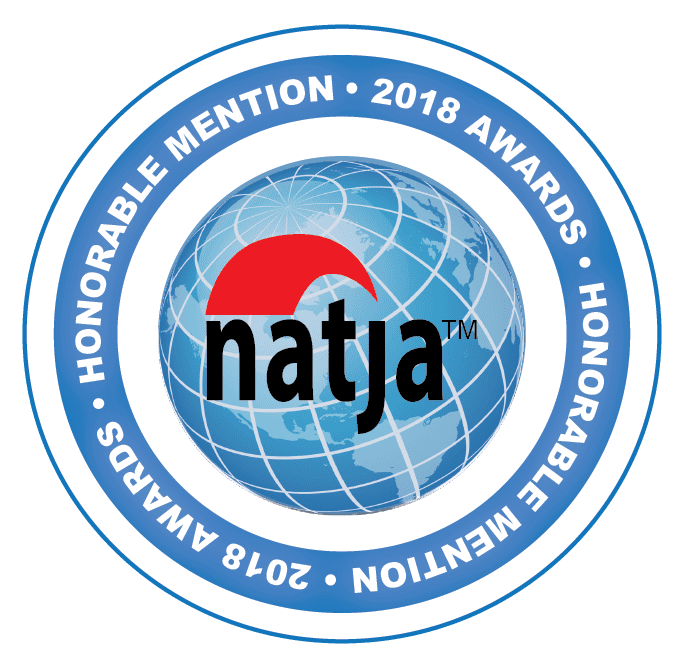 As a PADI Advanced Diver (you only need to be a certified diver to dive The Florida Aquarium), my training taught me how to do giant stride entry and a backflip entry, but nothing like what we did at the aquarium. We jumped into a cage-like aluminum and plexiglass box that took us to the bottom. It felt a little like a shark cage, but they said it’s for the protection of the aquarium only. No worries, it was the easiest descent I have ever made. 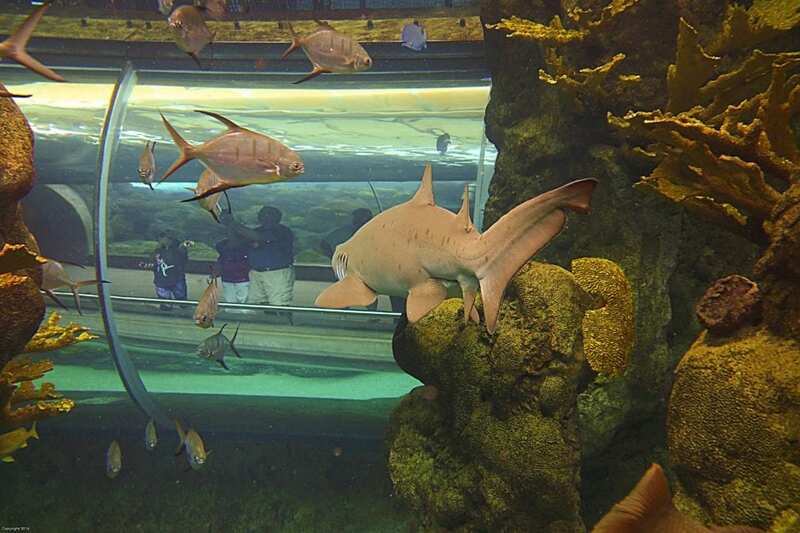 We stepped out of the protective cage and into the shark’s lair. 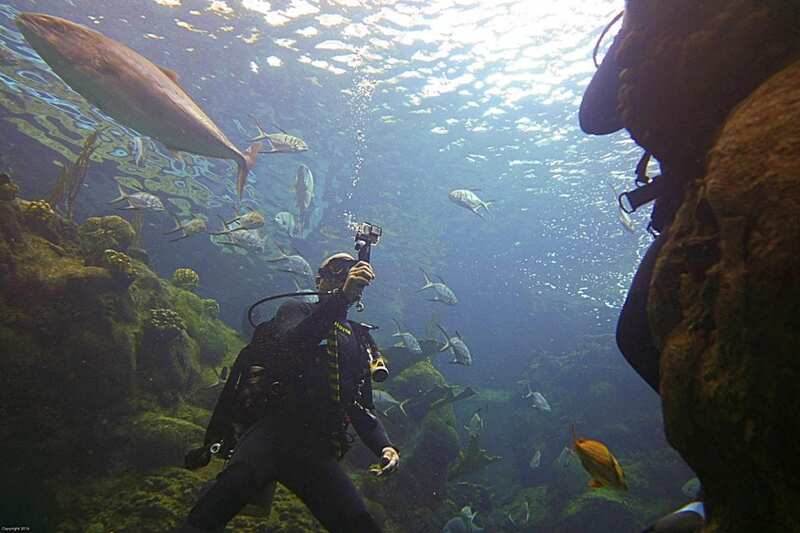 The aquarium dive consisted of three stops at three different biospheres on the coral reef. For the first stop, we rested on the sandy bottom. 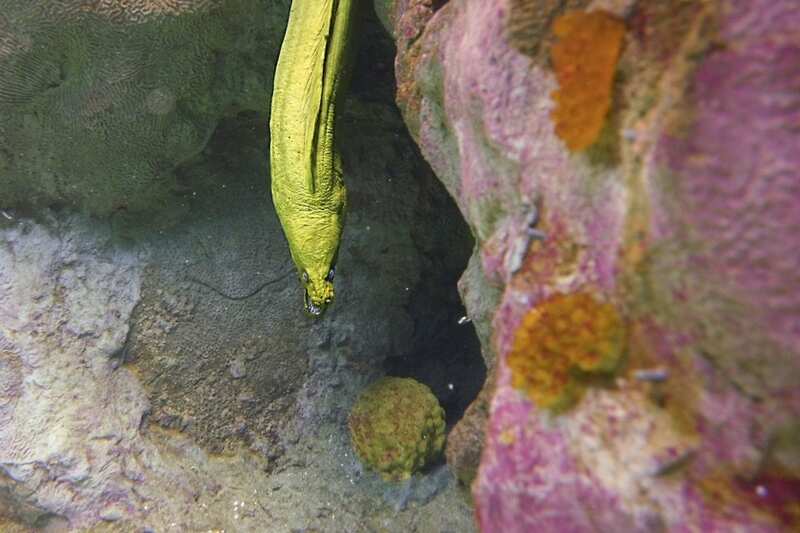 Here we saw eels and rays brazenly swimming up to us. In fact, a giant snapper got right up into my face. Flip the turtle came by to check out his new guests. I dutifully stepped aside and dared not challenge his authority. We could see the first human visitors of the day gawking at us outside the tank. I wonder if we inspired any of them to take up diving one day. We found a nurse shark hanging below the coral reef but the big boys, the sand tiger sharks, were slowly circling overhead. The next station was halfway up the reef where we were instructed to grab onto some well-disguised handholds. They looked like coral, but they were actually just plastic. This stop was halfway between both types of sharks. A nurse shark swam up to greet Katie and a few rays popped up from below too. The tiger sharks just continued their patrol above us. 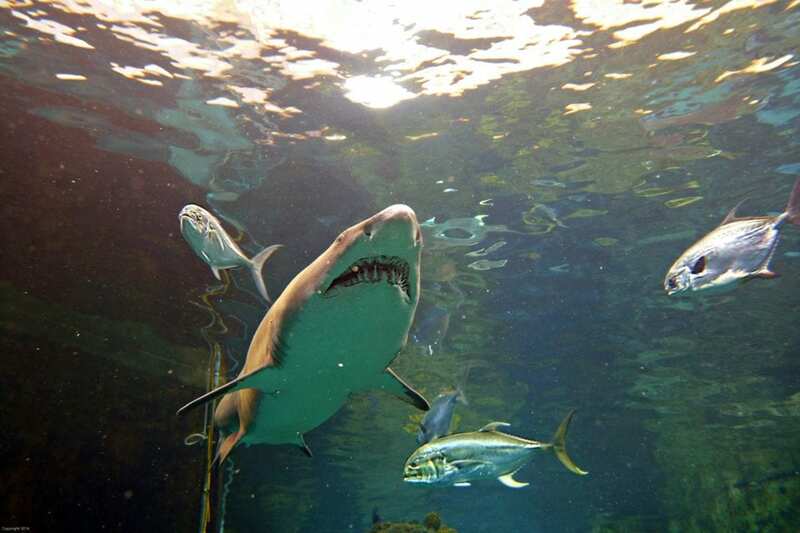 We couldn’t help but marvel at how smoothly and powerfully they swam. This region was more than a different vantage point. It was an entirely new life zone. That’s something I never realized looking in from outside the tank. The final zone was positioned right next to the observation tunnel. 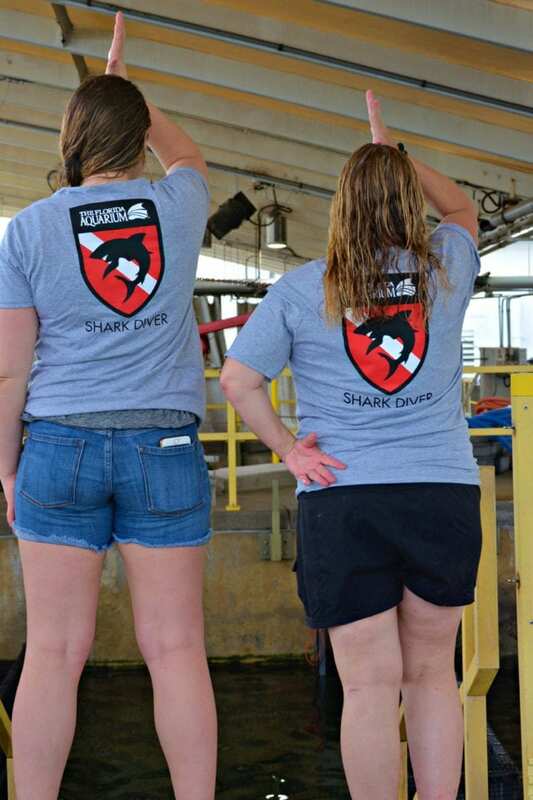 We were smack dab in the middle of tiger shark alley. The sand tiger sharks were now swimming remarkably close to us. We could count their teeth and stare into their cold, business-like eyes. 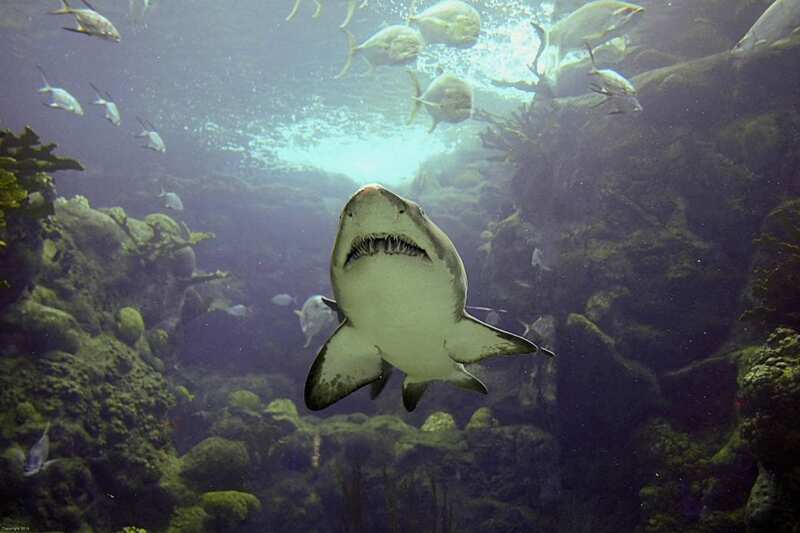 From a distance, all sharks are beautiful, but there is a point during their approach where they cross over your comfort zone. In the end, I think this is what shark diving is all about. There is no way that you can come this close to an apex predator and feel nothing. You have to acknowledge their power, accept it, and move on. I believe one of man’s greatest follies is the pathological need to be in absolute control. We surfaced at the rear of the tank, and our DMs helped us out of our gear. We returned to the locker room to remove the wetsuit and found a commemorative t-shirt and certificate of accomplishment. Those weren’t our only mementos for the day. Our DMs were recording our dive on GoPros, so we had footage which is on the video below. 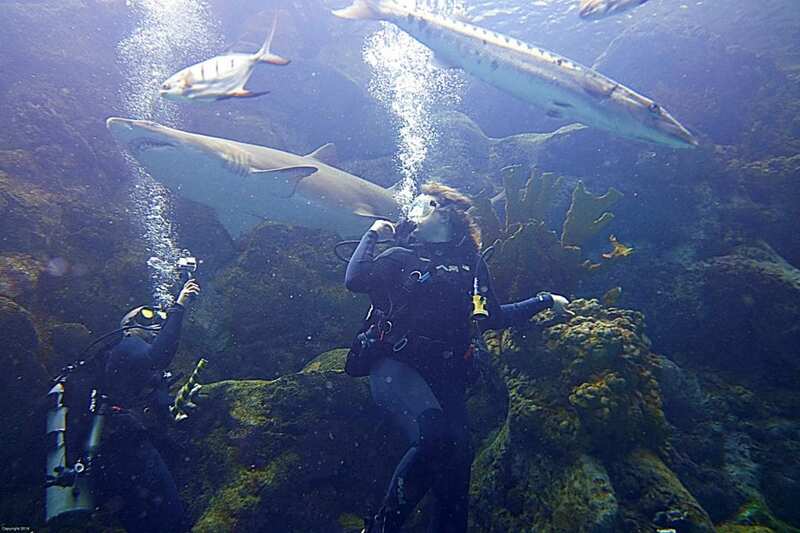 The Florida Aquarium offers other experiences to get non-divers involved too. 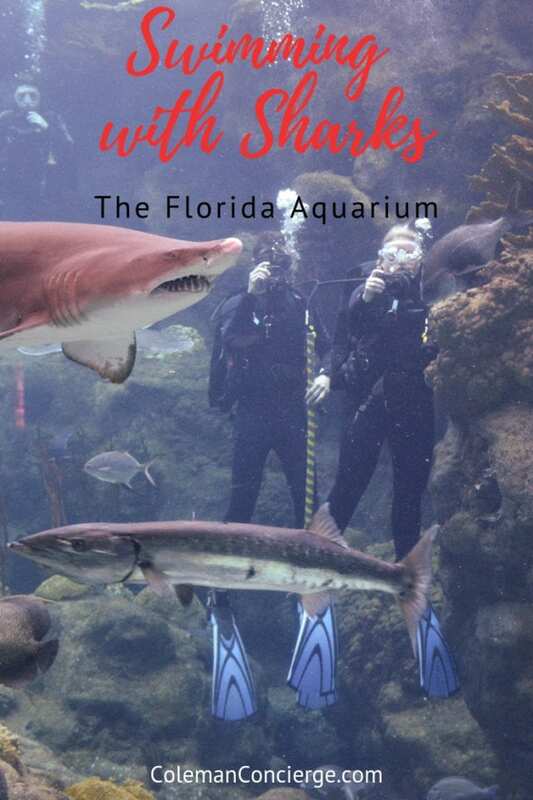 Their Heart of the Sea Swim offers a snorkel-like experience with Florida native fishes, sea turtles, and bonnethead sharks or their Swim with Sharks experience that takes place in the coral reef tank we just left. 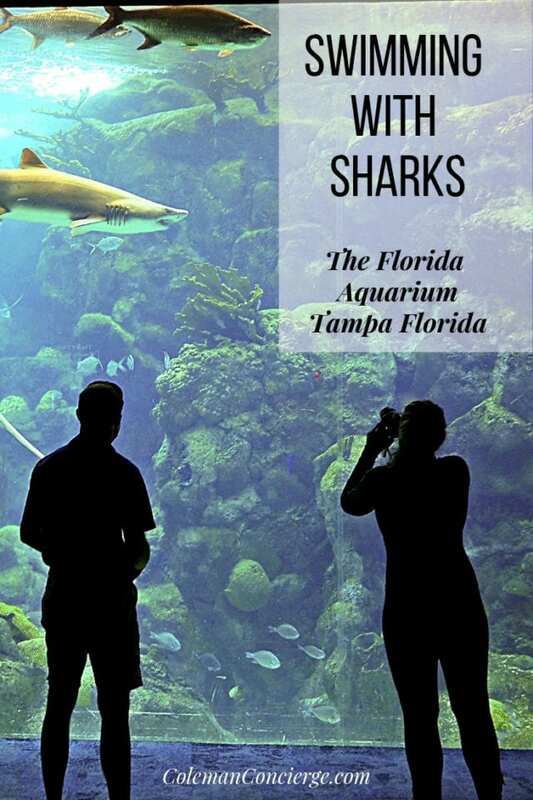 What more, aquarium admission is included for all in-water experience participants. 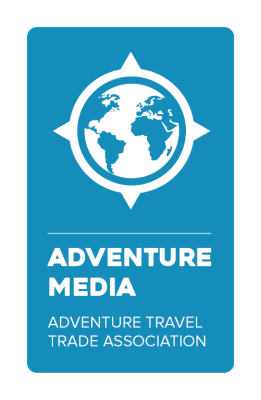 They also offer the Wild Dolphin Cruise, Penguin Backstage Pass, Close Up Critters, and Behind the Scenes Tour as additional programs above and beyond your general admission. 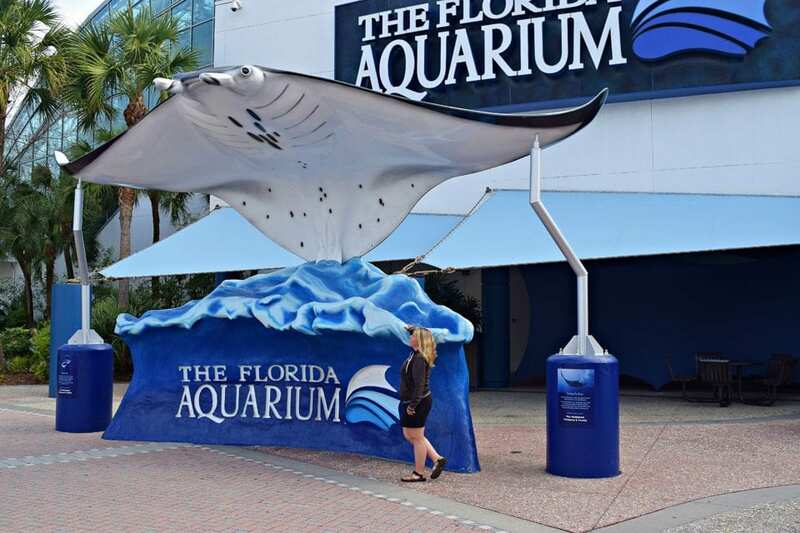 The Florida Aquarium was fun for us adults and highly rated for kids. It’s based on the concept of Florida water flowing from a freshwater spring down to the Florida Keys. 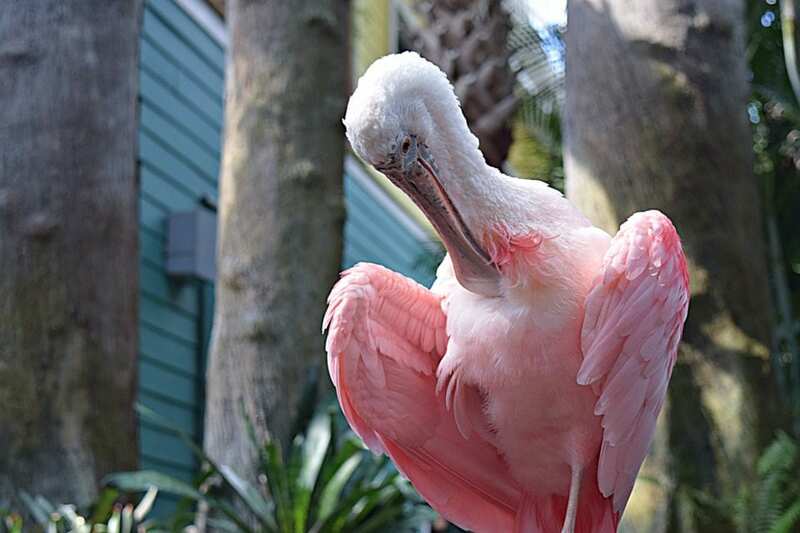 You can start on the Florida Wetlands Trail where you get to see alligators, otters, and free-flying birds. After the wetlands come Beaches and Bays where you’ll discover creatures like toadfish, jellyfish, and whatever else we put into the pictures. The littoral zone empties into the open water of the Coral Reef where we did our dive. 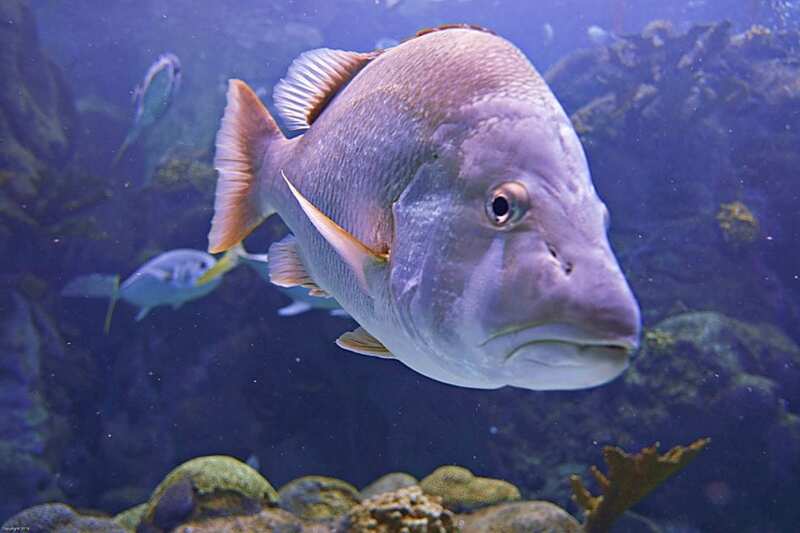 There are other top-notch exhibits at the Florida Aquarium as well. 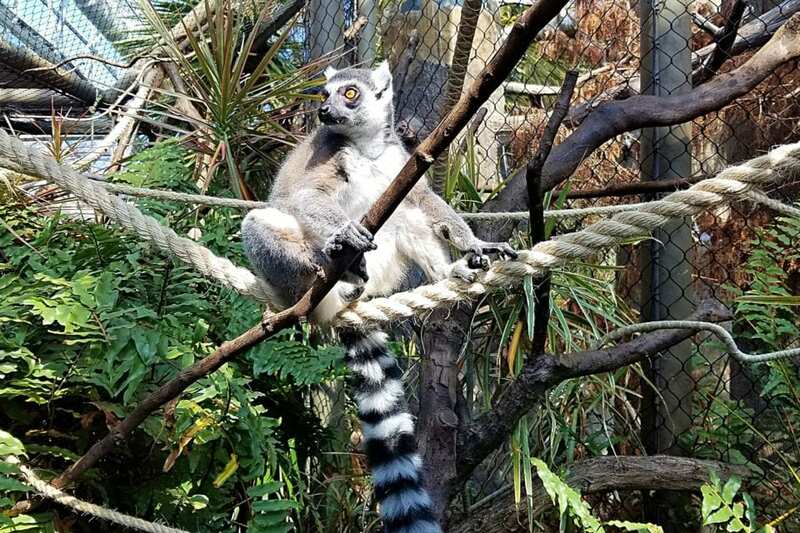 The Madagascar exhibit boasts colorful fish, birds, and even a couple of lemurs. The kids will love to interact with the No Bones Zone touch pool, 4-D Theater, and the Splash Pad (bring a bathing suit for that). 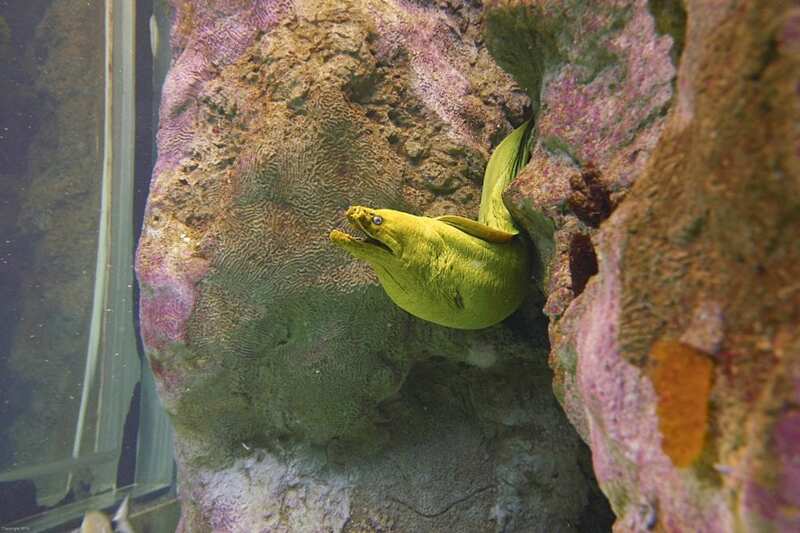 Some of their prettiest animals’ exhibits are the seahorses in Dragons Down Under and the octopus and jellies in Waves of Wonder. That sounds like a great place to start for us, but their commitment towards animals goes even farther. 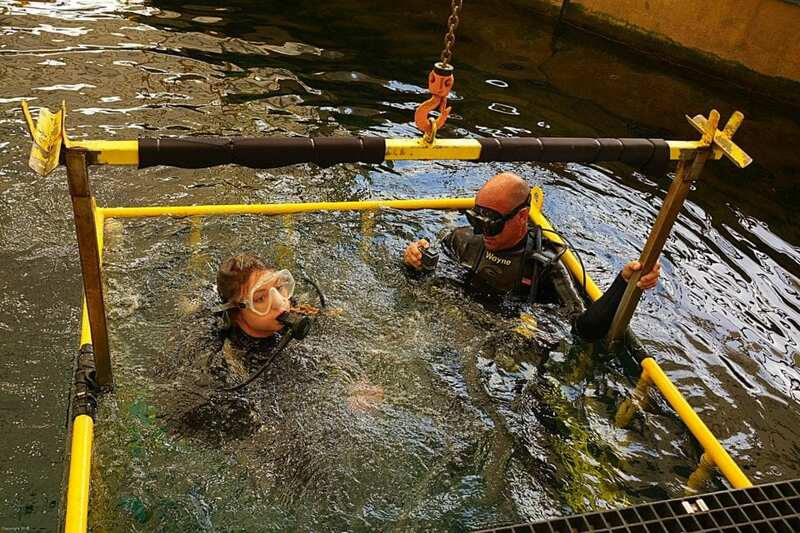 They have an Animal Response Team dedicated to the rescue, rehabilitation, and release of wild animals including their 4-million-dollar Sea Turtle Rehabilitation Center in Apollo Beach. 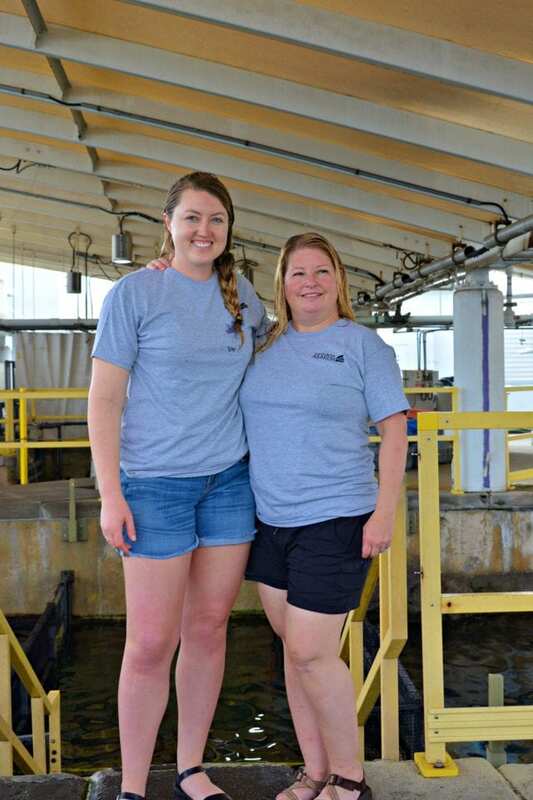 They lead efforts to protect sea turtles (you know we love saving baby sea turtles! 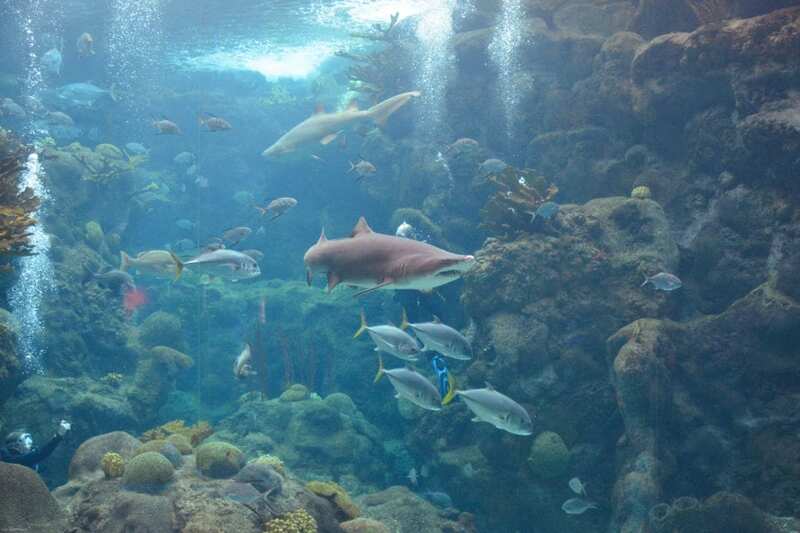 ), sharks, and corals. 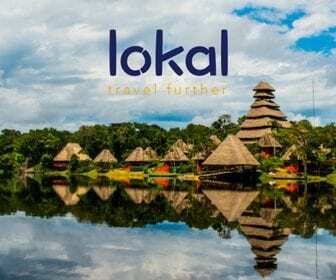 If you combine all of these special projects with the day to day introduction of the underwater ecosystem to guests and visitors, then you really have a force of good working for this planet’s one big ocean. 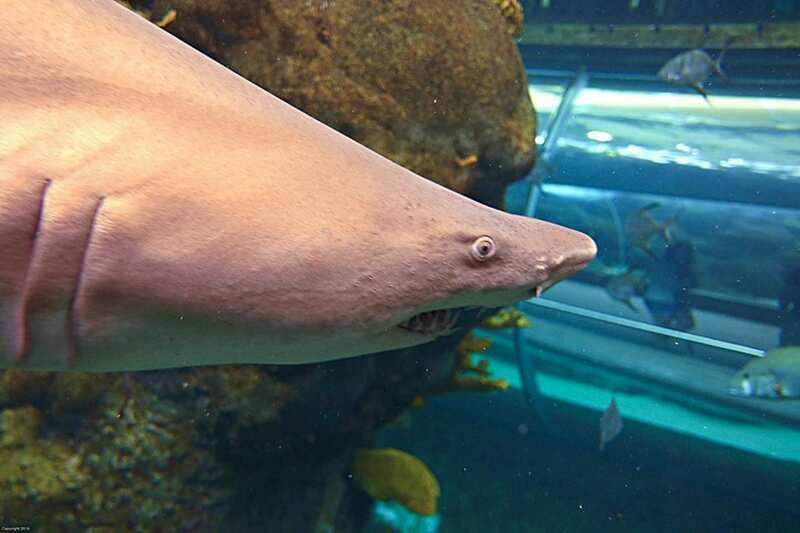 I really enjoyed my time at The Florida Aquarium. The customer service during my dive experience was spot on with all the little extras thought out. The dive itself was unique and exciting. I wasn’t ready to leave the water when my time was up, and I would love to do it again. The exhibits were well thought out with beautiful animals and displays. 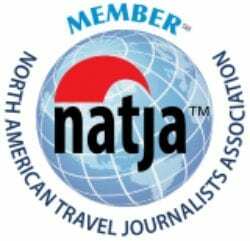 Most of all, I liked working with such an ethical and thoughtful organization. 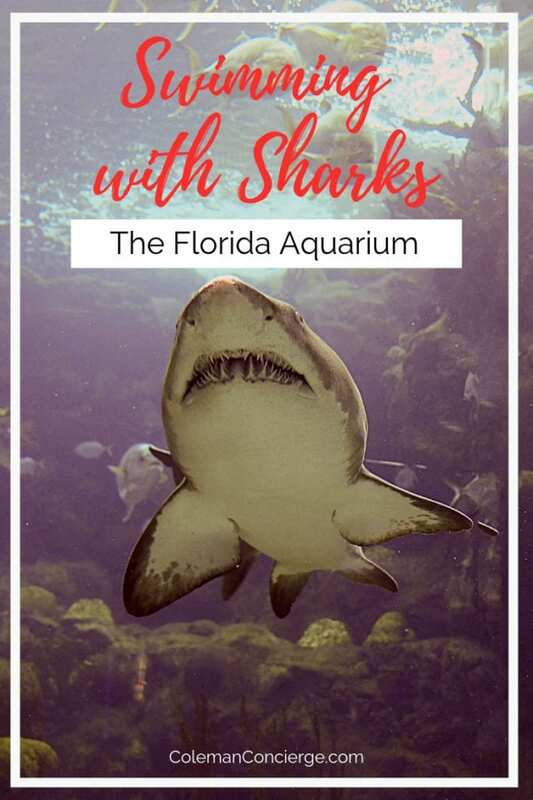 Disclosure: A big thank you to The Florida Aquarium for hosting us and setting up this fantastic experience! For more inspiration check out their Instagram, Facebook, and Twitter accounts. 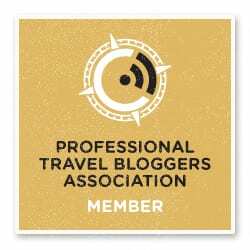 As always, the views and opinions expressed are entirely our own, and we only recommend brands and destinations that we 100% stand behind. Like it? Pin it for later on Pinterest! 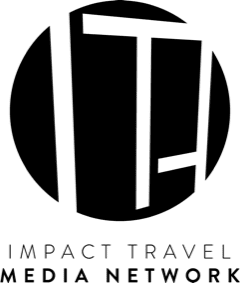 We are excited to share our journey with you!